If you have any questions about the Hamilton information page below please contact us. 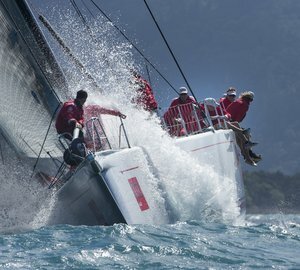 Luxury crewed sailing yacht Hamilton is a beautiful 86 ft Swan which will be cruising the waters of both the Caribbean and Southern England this year. 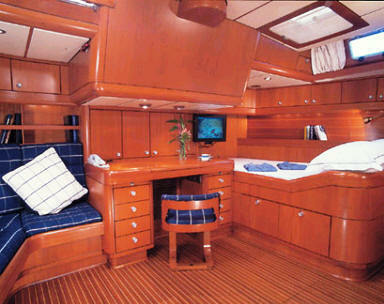 This Swan 86 boasts all the usual quality trade marks one has come to expect from her creator’s work, Nautor. 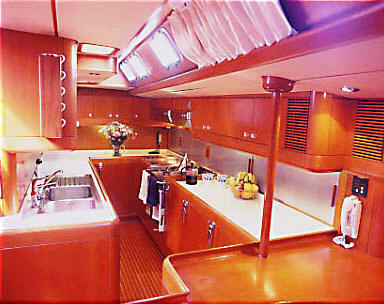 These features include light and spacious interiors, as well as plenty of room in the socials areas such as the cockpit and deck areas - all finished in the highest quality teak. Sailing charter yacht Hamilton boasts a full width saloon with an excellent entertainment system that supports CD, wide-screen TV and DVD played through a high quality stereo system. There is a conversation area perfect for pre or post dinner drinks and a total of 3 Cabins that accommodate 6 guests. Gourmet meals prepared by her talented chef and served by her experienced crew can be enjoyed either in the main Saloon or up on deck under the warm summer sky. Hamilton provides charter guests with an impressive range of water toys, an experienced crew of four and luxurious accommodation. 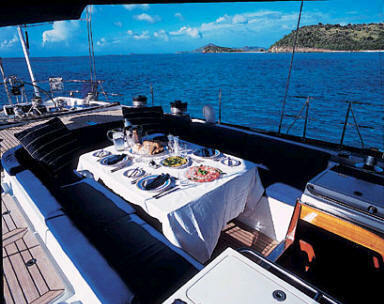 When you combine this with performance under sail you are sure to have an unforgettable yacht charter vacation in either the Caribbean or New England. 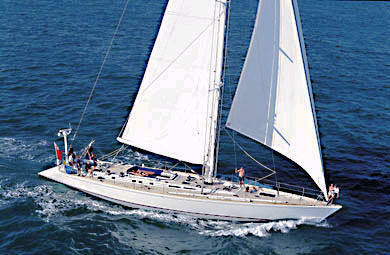 Luxury crewed sailing yacht Hamilton provides accomodation for a total of six. 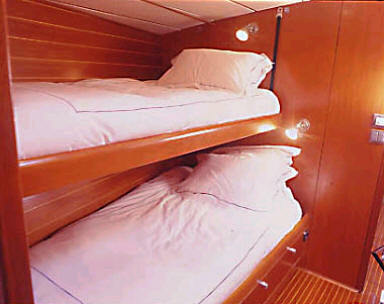 She has one double and two twin cabins, each with en suite shower rooms. 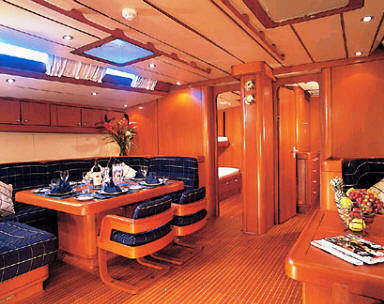 Dinning can be enjoyed in either the main saloon or cockpit. Luxury Sailing Yacht HAMILITON comes equipped with the following extras and amenities:COMMUNICATION EQUIPMENT INCLUDES Mini M Satellite Communications (Phone, fax and data), Cellular phones (Phone, fax and data), PABX extensions to all cabins. WATER TOYS INCLUDE 13Ft (4.26m) Caribe RIB with 40 h.p. 4 stroke Yamaha O/B, water-skis, mono-ski, kneeboard, wakeboard and donut, snorkelling equipment, fishing gear. ENTERTAINMENT FACILITIES INCLUDE multi-standard wide screen TV with DVD/VCR in saloon, scan converter (laptop displayed through saloon TV), flat screen TV with DVD in aft cabin, independent CD in aft cabin, 30 CD/audio cassette player. Forward guest cabins music from main entertainment system. There is also an extensive DVD/CD library. There is airconditioning throughtout and also a watermaker. The luxury yacht Hamilton displayed on this page is merely informational and she is not necessarily available for yacht charter or for sale, nor is she represented or marketed in anyway by CharterWorld. This web page and the superyacht information contained herein is not contractual. All yacht specifications and informations are displayed in good faith but CharterWorld does not warrant or assume any legal liability or responsibility for the current accuracy, completeness, validity, or usefulness of any superyacht information and/or images displayed. All boat information is subject to change without prior notice and may not be current.